Though usually regarded as a footnote in automotive history, Maxwell Motor was one of the leading automobile producers in the United States during the first quarter of the twentieth century, and its cars offered several innovations to buyers of the time. For instance, Maxwell's was the first popular car with its engine in front instead of under the body, the first to be designed with three-point suspension and shaft drive, and one of the earliest cars to feature thermo-syphon cooling. In Maxwell Motor and the Making of the Chrysler Corporation, Anthony J. Yanik examines the machines, the process, and the men behind Maxwell, describing both the vehicle engineering and the backroom wheeling and dealing that characterized the emergence and disappearance of the early auto companies. In this detailed history, Yanik charts the company's evolution through the early Maxwell-Briscoe years, 1903-1912; the Maxwell Motor Company years, 1913-1920; and finally the Maxwell Motor Corporation years, 1921-1925. He considers the influential leaders, including Jonathan Maxwell, Benjamin Briscoe, Walter Flanders, and Walter P. Chrysler, who executed the business decisions and corporate mergers that shaped each tumultuous era, concluding with Chrysler's eventual deal to transfer all Maxwell assets to form a new Chrysler Corporation in 1925. Yanik also discusses the aftermath of Maxwell's dissolution and the fate of its famous corporate leaders. For this study, Yanik draws on a wealth of primary sources including old automotive trade journals, the writings of Ben Briscoe and William Durant, and company records in the Chrysler archives. 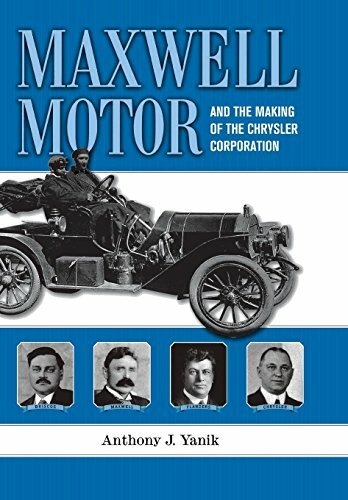 Maxwell Motor and the Making of the Chrysler Corporation fills a gap in existing automotive scholarship and proves that the Maxwell story is an excellent resource for documenting the development of the automobile industry in the early twentieth century. Auto buffs and local historians will appreciate Yanik's thorough and engaging look at this slice of automotive history.